ALL IRELAND’S MAJOR supermarket chains enjoyed a bumper Christmas – but SuperValu was the company that cemented its place as the new number-one player in the grocery game. The Musgrave-owned network of stores commanded more than 25% of the total grocery market during the 12 weeks to 3 January, according to the latest figures from analysts Kantar Worldpanel Ireland. 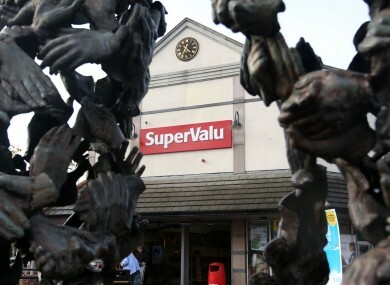 SuperValu’s sales were up in value by 4.3% compared to the same period in 2014-15, when Tesco was still the most successful supermarket chain in the country. The UK-headquartered retailer this year commanded 24.6% of the market – down from 25.4% 12 months earlier – with its sales increased only a slim 0.1% on last year’s Christmas tally. Overall, the data showed consumers were opening their purses and wallets wider in the crucial shopping period. Sales across all grocers were up 3.5% on last year with the only decline coming from the smaller chains. Kantar Worldpanel director David Berry said the period was the most important season for grocery retailers and this year sales were up €77 million across all stores. This is a clear sign of increased consumer confidence as shoppers worry less about what they’re spending,” he said. Lidl was the biggest winner with the German chain’s sales up 11.6%, giving it a slightly larger proportion of shoppers’ business than rival Aldi. Dunnes also posted a strong gain in sales value, which Kantar Worldpanel put down to the supermarket’s continued ability to pull in people doing the “big shop”. Email “These are the supermarkets that won and lost in the Christmas showdown”. Feedback on “These are the supermarkets that won and lost in the Christmas showdown”.